Having made it to the England-Scotland border just north of Berwick-upon-Tweed we’re now going to spend the next seven days driving down the historic A1 to London then on to Brighton. Up until now we’ve made very few journey’s via motorways, preferring to take more minor (and therefore slower) roads, but it seems apt to finish the trip following the route of the Great North Road – which the modern A1 mainly follows. The Great North Road was a major coaching route in Britain and was used by the mail coaches between London, York and Edinburgh. It is often mentioned in English literature, for example Pickwick Papers by Charles Dickens. The modern course of the A1 diverges somewhat from the Great North Road, particularly where it passed through a town or village that has subsequently been bypassed, or where new motorway standard road has been constructed on a more direct route. The A1 is the longest numbered road in the UK at 409 miles (658km) long and connects the capital of England (London) with the capital of Scotland (Edinburgh). It was once the busiest motorway in the country with an active roadside economy of shops, cafes, hotels. In the 1950s it was supplanted by the newly constructed M1 a speedier and smoother motorway for an England moving slickly into a modernity of effeciency and consumerism. 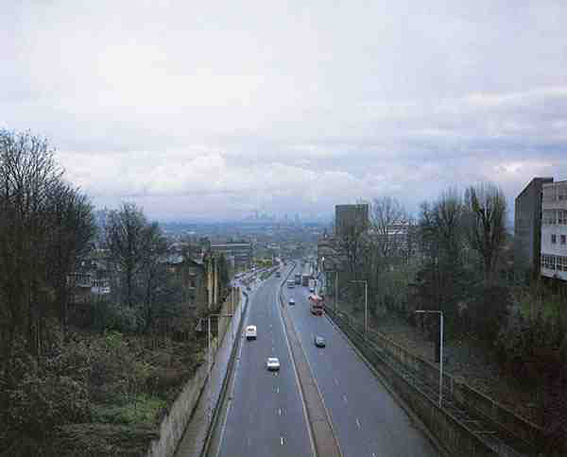 Photographically, the A1 is most readily associated with the work of British photographer Paul Graham. Graham spent two years photographing along the route of the A1 with a large format camera. The work was eventually published in 1983. 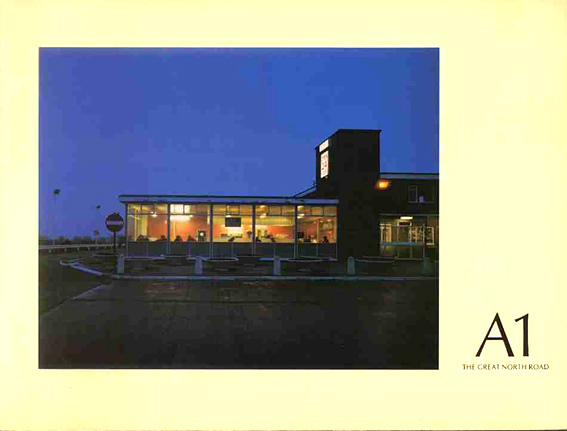 A1 —The Great North Road was Graham’s first book and contained 41 color reproductions. The photographs are a mournful document of a grey nowhere land in a country moving too fast to stop for a cup of tea. The book is now a valuable collectors item, valued at over £250, not bad for a self-published paper back! I’ve posted up a couple of the pictures from the book here, but you can see more on Graham’s website. According to many commentators, Graham’s A1 photographs had a transformative effect on the black and white tradition that had dominated British art photography till that point. This work, along with Graham’s later photographs of the 1980s – the colour images of unemployment offices in Beyond Caring (1984-85), and the sectarian marked landscape of Northern Ireland Troubled Land (1984-86) – were pivotal in reinvigorating and expanding this area of photography, by both broadening it’s visual language, and questioning our notions of what such photography could say, be, or look like. 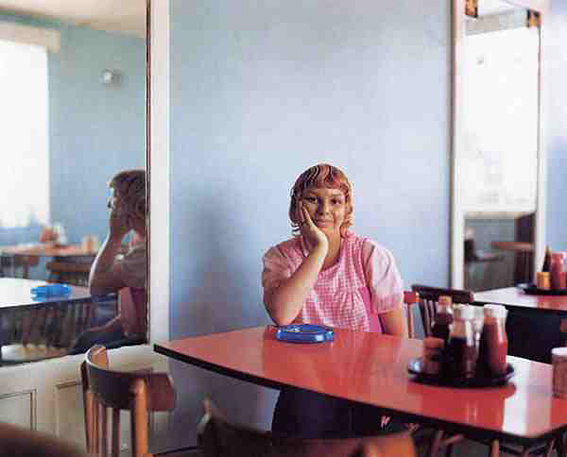 Photographers like Martin Parr made the switch to colour soon after, and a new school of British Photography evolved with the subsequent colour work of Richard Billingham, Tom Wood, Paul Seawright, Anna Fox, among others. This entry was posted on Sunday, September 7th, 2008 at 3:47 am	and is filed under INSPIRATION, PLACES, TRIP LOGISTICS. You can follow any responses to this entry through the RSS 2.0 feed. Both comments and pings are currently closed. You look like a cool guy but is that Englishness concept relevant in any way? Who cares about Englishness apart some English retards? Oasis? Martin Parr? Benny Hill??? @sue.. Wow I really don’t know what to say to a comment like yours. You have honestly left me stunned! If you don’t care about England then fine but you should really try and grasp the concept of the work and try to at least a little context of the changes that happened throughout Britain post 1979. Maybe you should look at Graham’s later work ‘beyond caring’ and Martin Parrs ‘cost of living’ get an idea of the economic changes in Thatchers new Service economy and then take at look at the work of Sirkka-liisa Kontinen in ‘Byker’ or Colin Jones ‘Grafters’ or more importantly the work of Tony Ray Jones and maybe, just maybe, you will think twice before making such strong judgements about the idea of ‘Englishness’. My uncle used to collect me and siblings, travelling from Carlisle to London,return, in the early 1950s, in an old Rolls Royce. The journey took 10 hours, on the old Great North Road, travelling through villages and I don’t remember stopping for breaks (we must have had toilet stops but they don’t figure in my memory). We had sandwiches etc. for sustenance. I live in St Neots, on the edge of the A1 and Great North Road and often think that I must have passed through this town on the way up North.